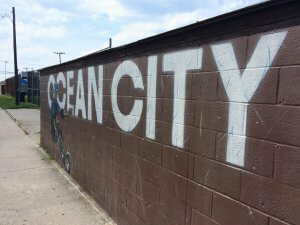 Because Ocean City sits on such a narrow strip of land, surrounded by water on either side and made up mostly of sand, pavement, Boardwalk and highrise condos, most people don’t assume there’s much green space in town. 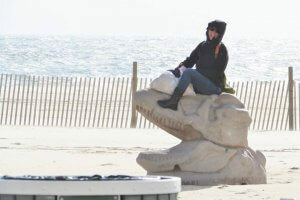 But there is — in fact, there are 17 parks in Ocean City according to Ocean City’s department of Recreation & Parks. 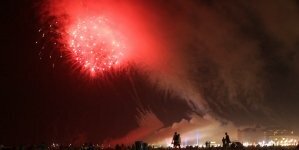 While a few of them are simply hidden-away fishing holes or children’s climbing equipment jutting out of the sand, others are sports centers, rolling pastures, informative exhibits and even a skate bowl. 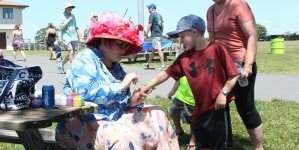 Ocean City’s parks are as diverse as the town and the people who visit it, and from the avid fisherman to the overactive 10-year-old, there’s a little something here for everyone. We’ll start at the southernmost end of Ocean City and work our way north. 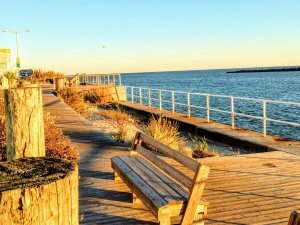 The Inlet Park consists of a Boardwalk perfect for fishing off, as well as benches, binoculars and signs with fun facts about Assateague Island (look through the binoculars on a clear day and you’ll see straight to it). Crabbing are fishing are welcome here, and on a quiet day, your only companion might be the “Inlet Indian” totem pole. Moving just a block north and over to the bayside, you’ll find yourself at Sunset Park. Native plants brighten up the promenade, and here you’ll find views of the Atlantic Ocean, the Commercial Fishing Harbor and the Sinepuxent Bay are unbeatable. Restrooms are open during special events, and during the season you’ll often find live music and Movies in the Park. 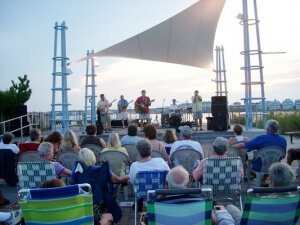 Live music at Sunset Park. 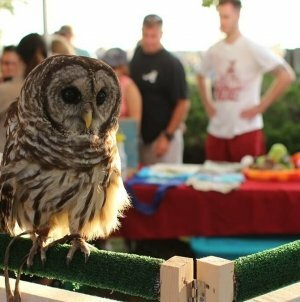 Wally made his debut on the beach in 2016, replacing the old wooden structures that formerly served as beach playgrounds. Wally’s sister playground is a pile of dinosaur bones located a few streets north (see below). Aside from Wally and the dinosaur bones, there’s only one real playground on the beach, and it’s on the Boardwalk at North Division Street. 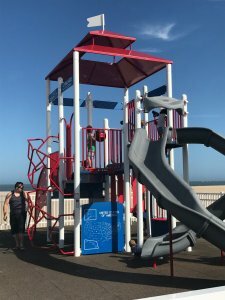 The playground features three slides, monkey bars, a small ice cream stand and a map of the United States that are perfect for kids when they’re done playing in the surf and sand. The Boardwalk Playground was brand new in 2017. Don’t worry, he doesn’t bite! He’s fun to play on, but luckily the closest living animal in Ocean City is the seagull. Here you’ll find four public courts where you can pick up a game during daylight hours. Individual courts can also be reserved for $35/hour for residents and $42/hour for non-residents. 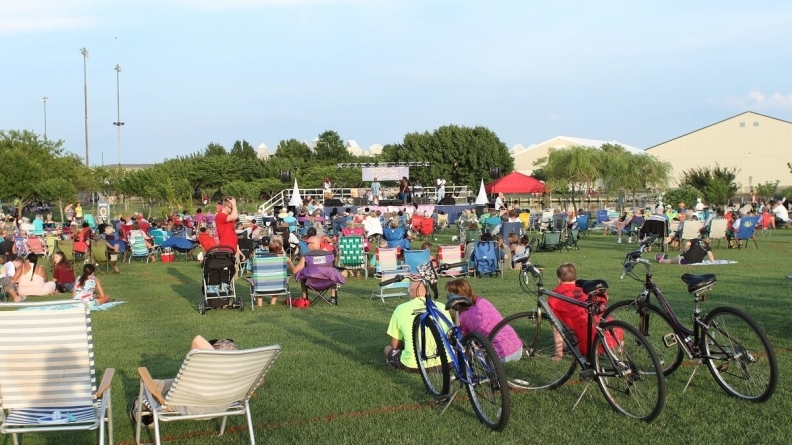 If you’re looking to stay active during your summer vacation, you might just find yourself at Ocean City’s Downtown Recreation Complex. 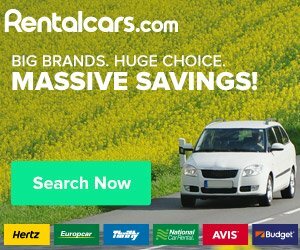 Here you’ll find all the recreational amenities you could need in one place, and there’s even a Victorian-themed promenade on the bay where you can fish and crab. It’s right by the Ocean Bowl Skate Park. The Ocean Bowl blends east coast and west coast styles to make the perfect 17,000-square-foot park, open daily in the summertime from 9:30 a.m. til dark. It features a pool bowl with a deep and shallow end, a large vert ramp and a mini ramp, and accommodates skateboarders and inline skaters of all abilities. 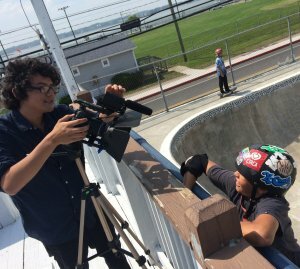 The Ocean City Skatepark is the oldest continually operating park of its kind in the country. 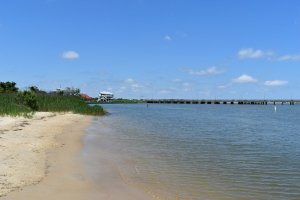 The Ninth Street Fishing Pier is one of the best places to fish in Ocean City, and it’s right in the heart of town. The pier includes cleaning tables equipped with hoses, and is just waiting for you to come hook the catch of the day. Robin Park is a little-known hideaway in Ocean City that’s perfect for families with small children. It includes a playground, picnic tables and enough open space to run around and play. The Convention Center park, just behind the Convention Center, consists of a long boardwalk on the bay that’s another great, if somewhat secret, spot to fish and crab. Game, set, match. The OC Tennis Center offers classes for kids and adults that can be booked online. In addition to the courts, on-site amenities include a hitting wall, tennis lounge, tennis shop, restrooms and free parking, and weekly and seasonal passes are available for purchase. Turn down 94th Street and you’ll see Little Salisbury Park on your right, in front of the Ocean City Center for the Arts and to the left of the OC Dog Park. The park includes two hard tennis courts, a basketball court and a playground. Your four-legged friends can come along to this park, too. 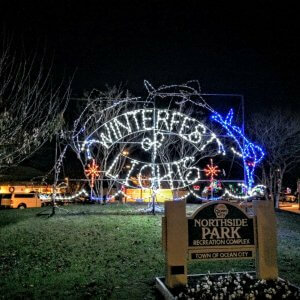 Ocean City’s biggest park is famously home to Winterfest of Lights. 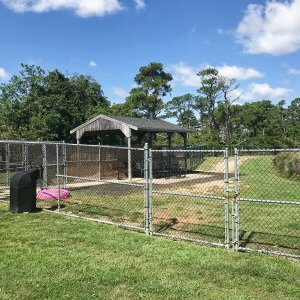 Find Gorman Park on the bayside in North Ocean City, where you can drop by for a game of tennis or racquetball or watch the kids play on the playground from the shade of a pavilion. Fiesta Park is a great little place to bring the family for a picnic or a walk on the trails. The wooded park allows for a peaceful and relaxing outdoor experience. 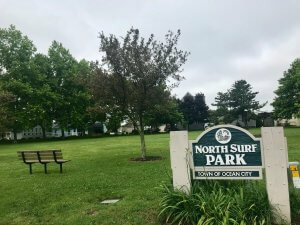 North Surf Park is located within a neighborhood on the northernmost end of Ocean City, just before the cross into Delaware. This park provides a playground and an open landscape perfect for running around under the shade of the trees. Peace and quiet at North Surf Park. Navigate your way through the West Ocean City McMansions by the Park and Ride and you’ll find Worcester County’s Homer Gudelsky Park (“Stinky Beach”). You can bring your pets to this beach even in the summertime, fish in the Sinepuxent Bay and, on most days, enjoy some much-needed peace and quiet. The view of the downtown Ocean City skyline from across the water can’t be beat.